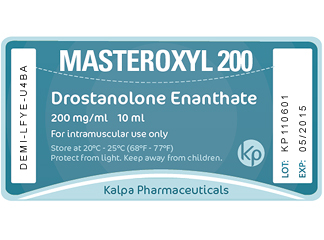 Masteroxyl 200 – active substance Drostanolone Enanthate – this is one of the most important esters used in the production of steroids. Enanthate will have a balanced level of hormone for about 10-14 days. This is what is called the length of ester. Although, in the medical field, frequently Masteroxyl 200 is administered biweekly or monthly, for use as a part of Masteroxyl 200 treatment. Your privilege is injection twice a week. Masteroxyl 200 effective dosage is 250-750 mg/week for men and 100 mg/week for women. The most common side effects of Masteroxyl 200 are those two most common DHT related side effects which include acne and hair-loss. It is considered to be a mild steroid and due to the fact that it does not aromatize, side effects such as Gynecomastia and water retention are of no concern.